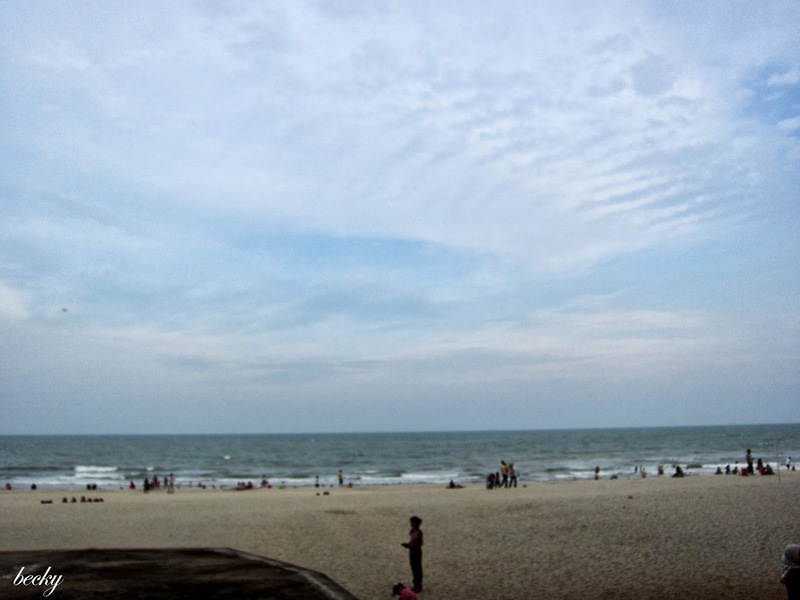 After so many many many years, finally I stepped foot into Kuantan again - Joe's hometown! 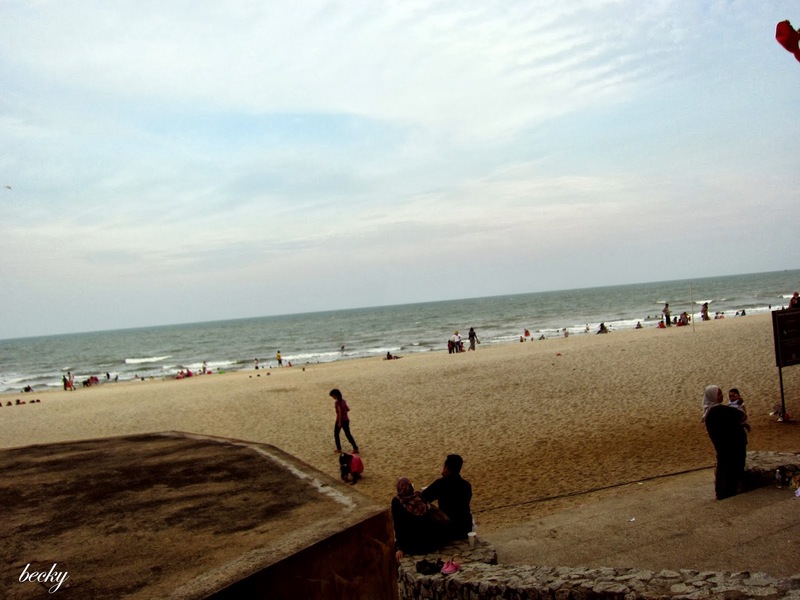 The first thing we arrived, I "kinda" force Joe to take me to the nearest beach - Teluk Chempedak. It was a windy day - nice weather! Though you can't really see from the pictures, but I could really feel that the monsoon is just round the corner - waves were hitting the shore and strong wind were blowing. Nevertheless, this did not stop the people to hang out and have some fun by the beach and/or in the water. There were some stalls by the side of the beach - ranging from food to accessories. Also, if you'd like, you could hang out by the eateries too - McDonalds, Starbucks and Chatime! 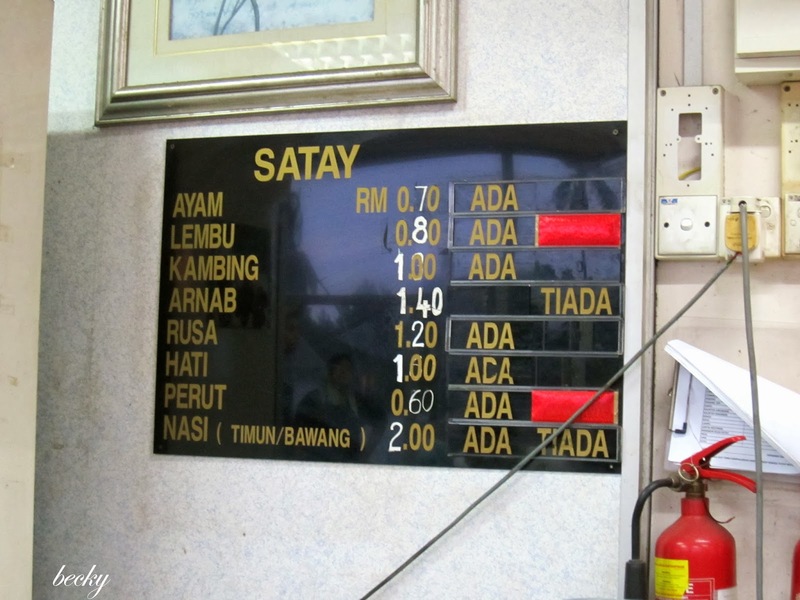 I wanted to oder the rabbit satay (Arnab), unfortunately, they were sold out for the day. So, we ended up ordering some chicken and beef (Lembu). 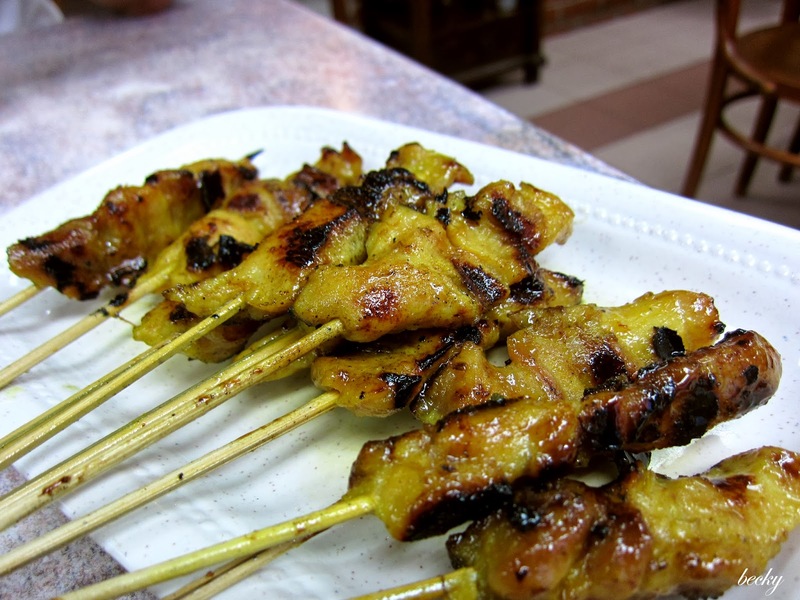 I really love the chicken satay! 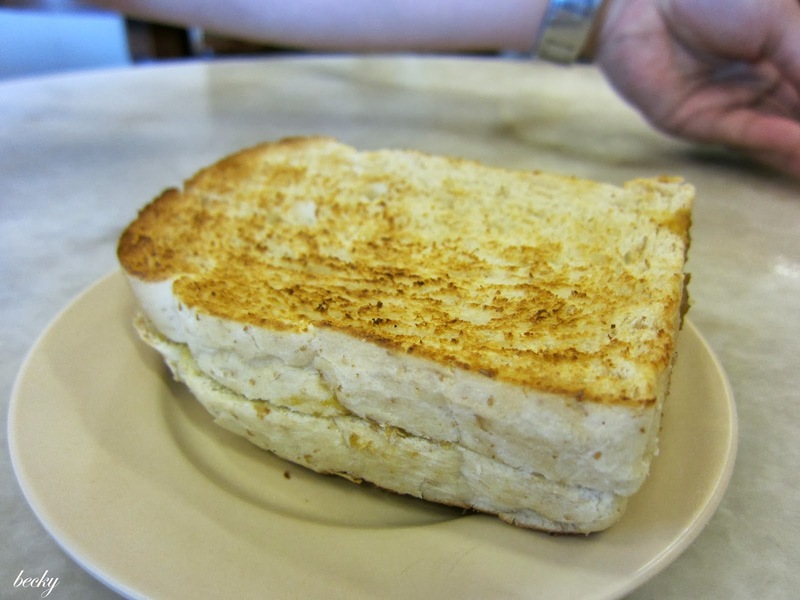 Compare to the ones that we have in KL or PJ area, theirs were marvelous! The main reason - without having any fat in between the meat BUT it wasn't dry at all! It was tender and has the smokiness that a satay should have. Usually you'd get a piece of fat in between of the meat on the skewers, so that the meat wouldn't get too dry during the bbq process. 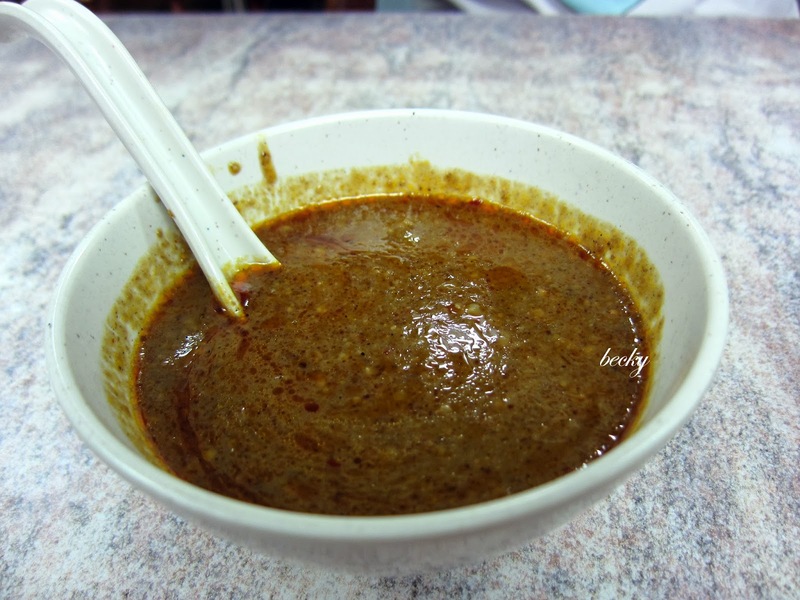 This is totally the opposite in Satay Zul. 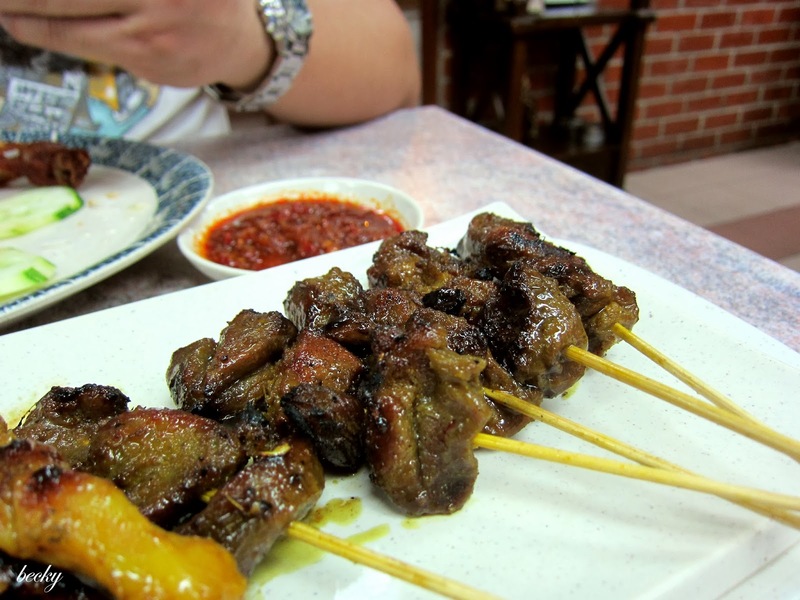 Compared to the chicken stay, the beef satay were a little tough for my liking. Personally, I'll still prefer their chicken satay. 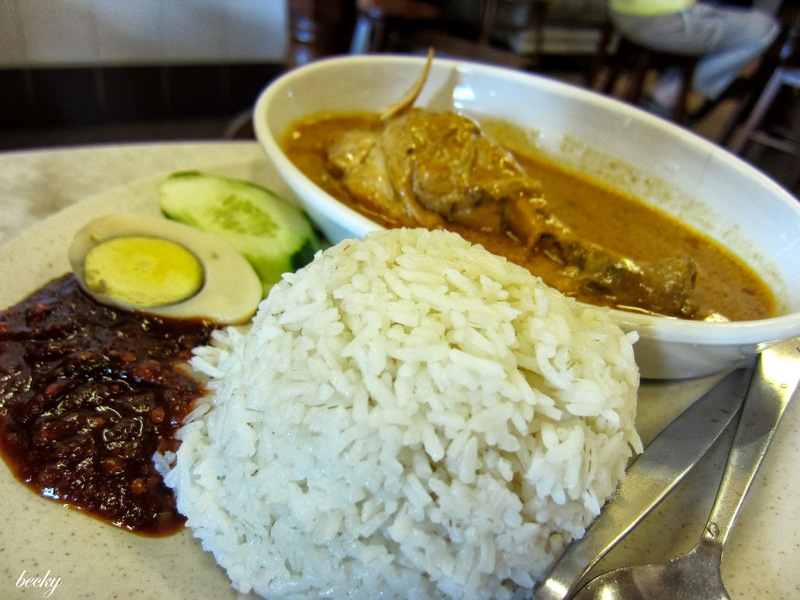 I tried the nasi lemak that Joe ordered, and I like the sambal a lot! With a little but of sweetness in the spicy sambal, and it totally gets you going non-stop. I did not try the rice nor the chicked, so couldn't comment much on it. 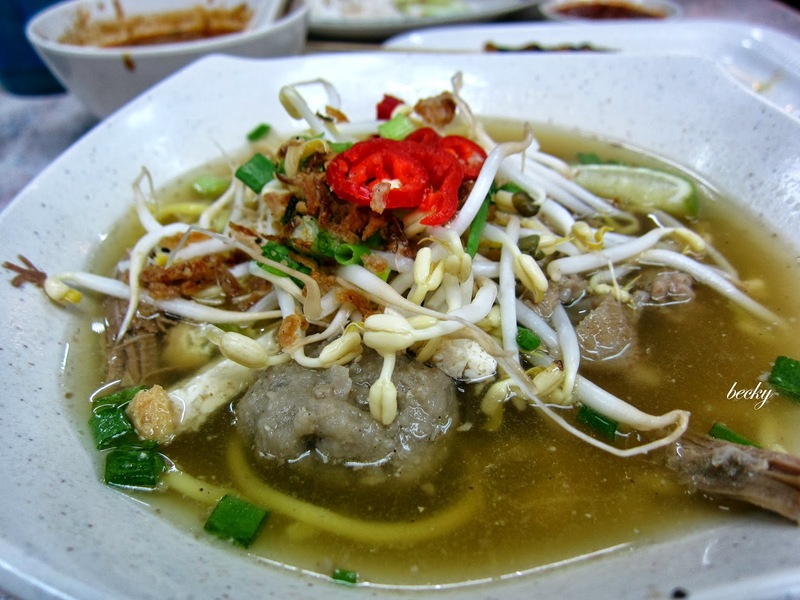 I was tempted to try out the Bakso, but﻿ did not really like it. The meatballs were too mushy for my liking. 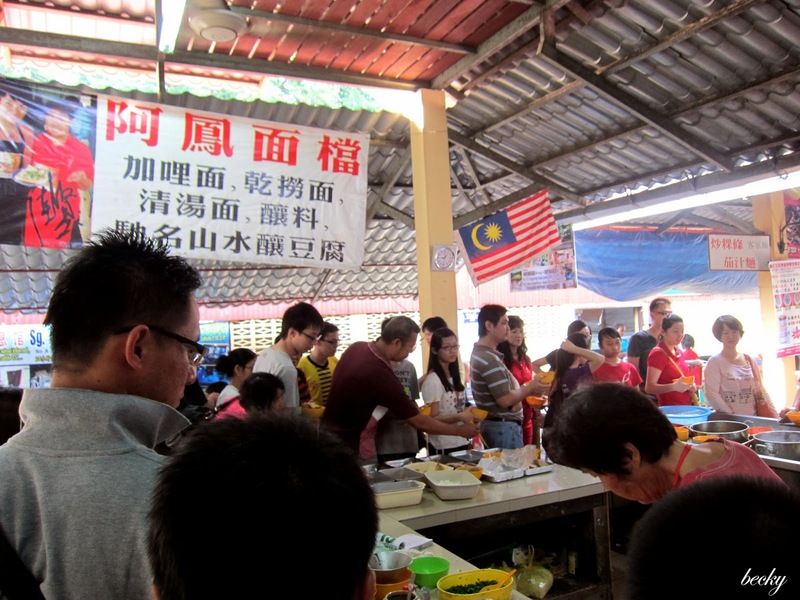 The next morning, Joe brought me to Sungai Lembing to try out the famous Toufu - I'm a really big toufu fan! We woke up kinda early (at least for me...) and took a 30 minutes drive to Sungai Lembing. 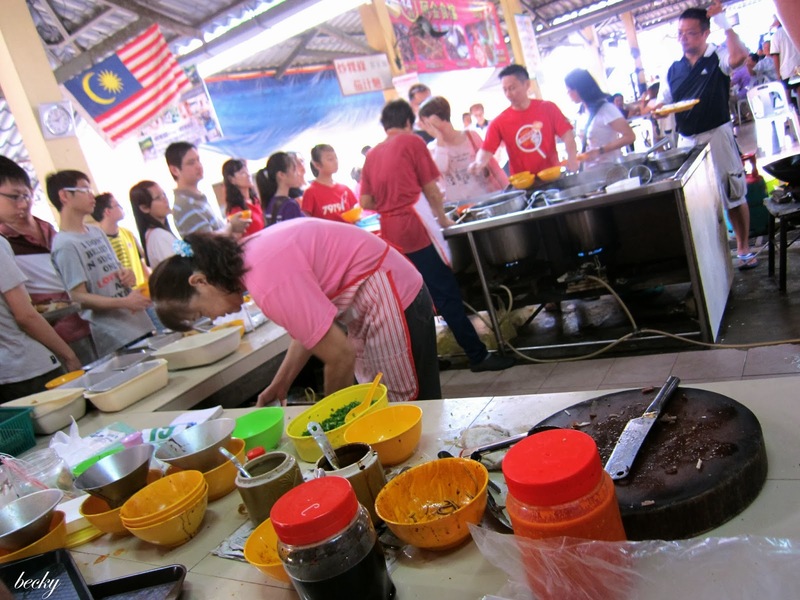 I thought we were early, but when we were at the stalls, we were greeted by a long queue and busy stalls' owners. I wanted to their curry laksa, but the person infront of us just took the last bowl. So, I had the same dish a Joe - Sungai Lembing Noodles. The toufu was also another simple dish, but same as the noodles - delicous! 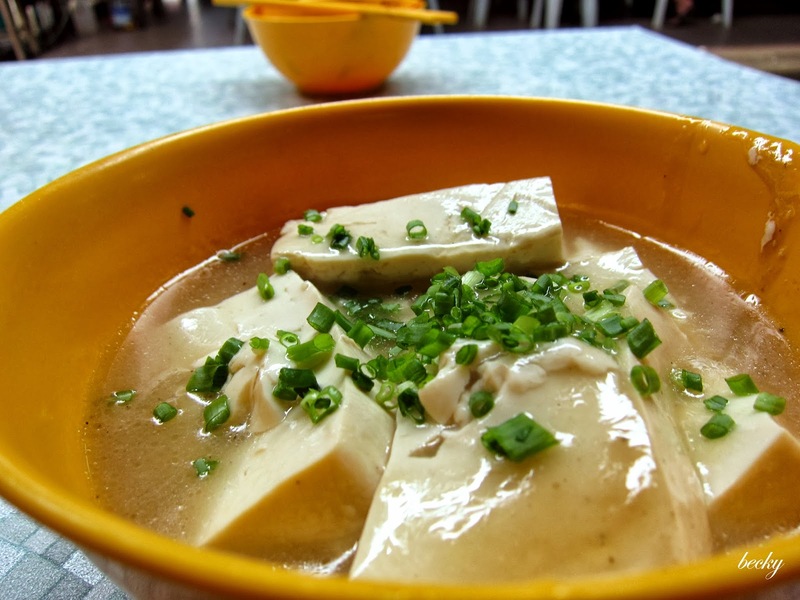 The toufu was silky smooth and the starch has added flavour this delicate ingredients. Their toufu was stuffed with minced meat, which added extra flavours and texture to it. 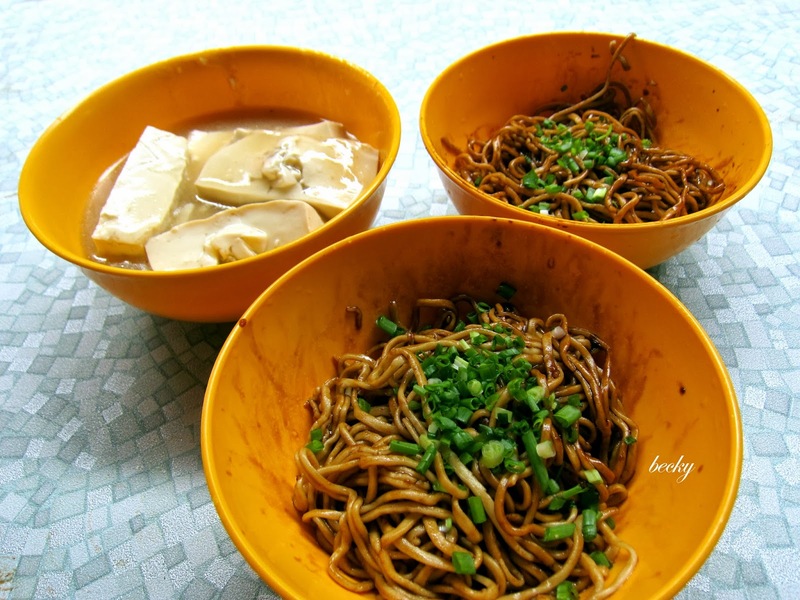 The total cost of this meal - 2 noodles and toufu - is RM5.50... super cheap or what!!!! After breakfast we took a stroll at the small, quite town of Sungai Lembing (didn't captured any photos though...), and headed back to Kuantan. 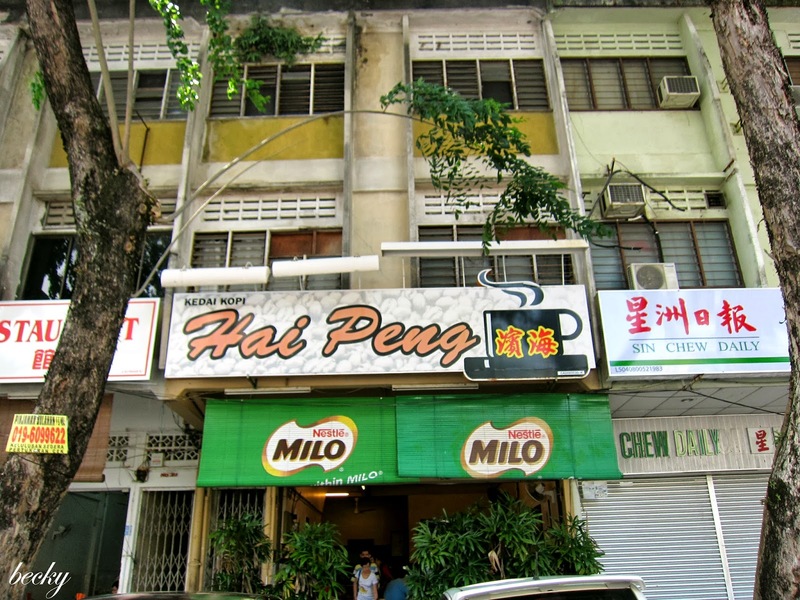 When we were out looking for our lunch, we came across this restaurant - Hai Peng. Sounds familiar? 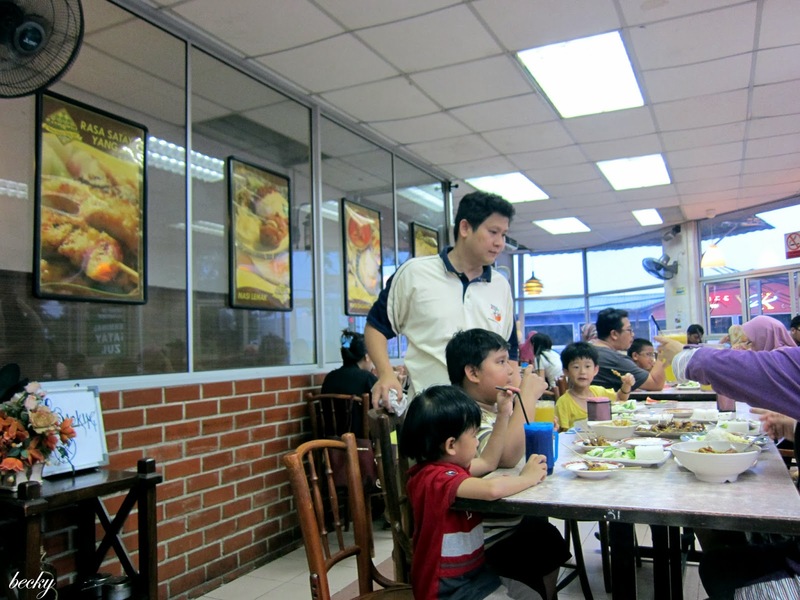 It's the kopitiam from Kemaman, and now they have a branch in Kuantan, opened and operated by their own family member. 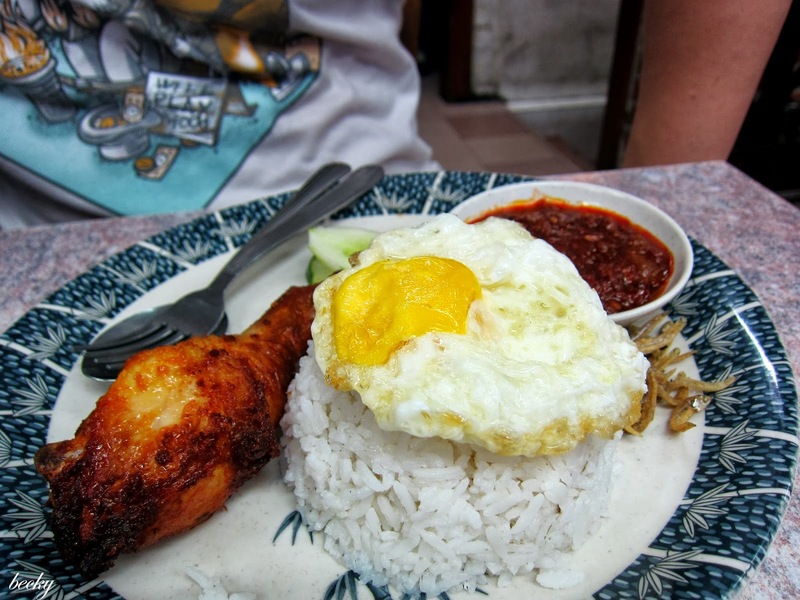 I'm starting to think that Joe really loves nasi lemak alot! 2 days in a row - nasi lemak! The curry chicken was delicious. I had a spoonful of the curry - it has the heat, the frangrance of the santan (coconut milk), and I could taste the spices in the curry. Another dish that keeps you going non-stop. 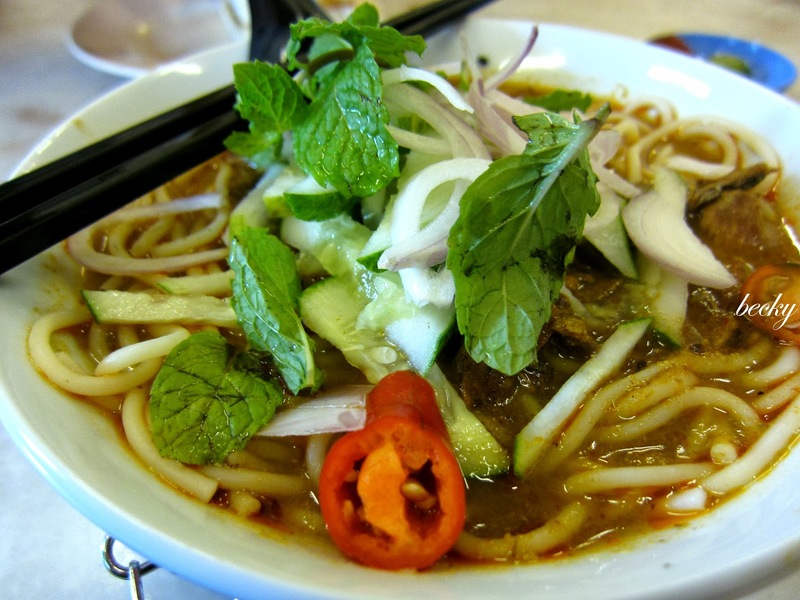 I actually wanted to order Laksa, or over there in Kuantan, they called it Curry Laksa; and when it say "Laksa", it is actually refering to "Asam Laksa". Confusing huh?! Nevertheless, this was a bowl of good laksa too. It was slightly different from the ones that you'd get in Penang.Tthough the broth was as flavourful, but personally, I find it's less acidic than the laksa in Penang - and I'd prefer this. I don't really fancy sourish or acidic dishes. 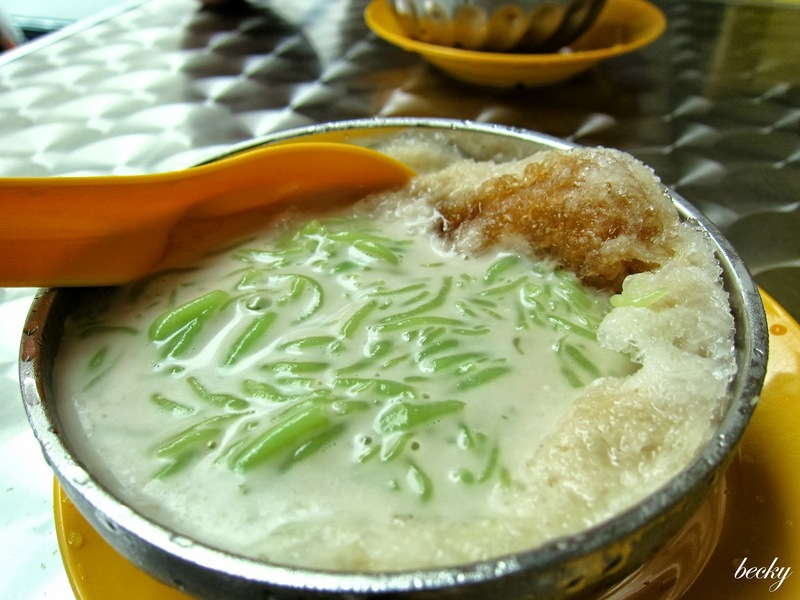 Joe brought me to this famous cendol shop in Kuantan - Cendol Air Putih. 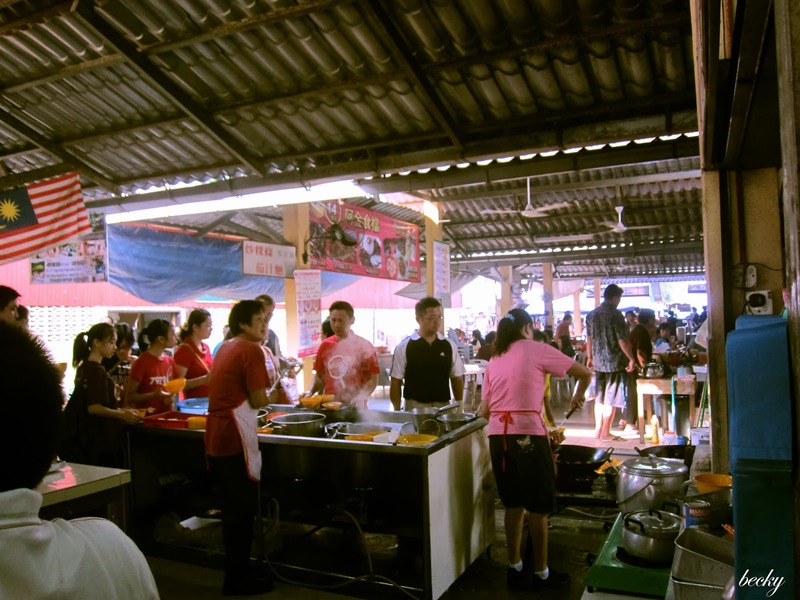 The place was packed with people enjoying their bowl of ice during the hot weather. 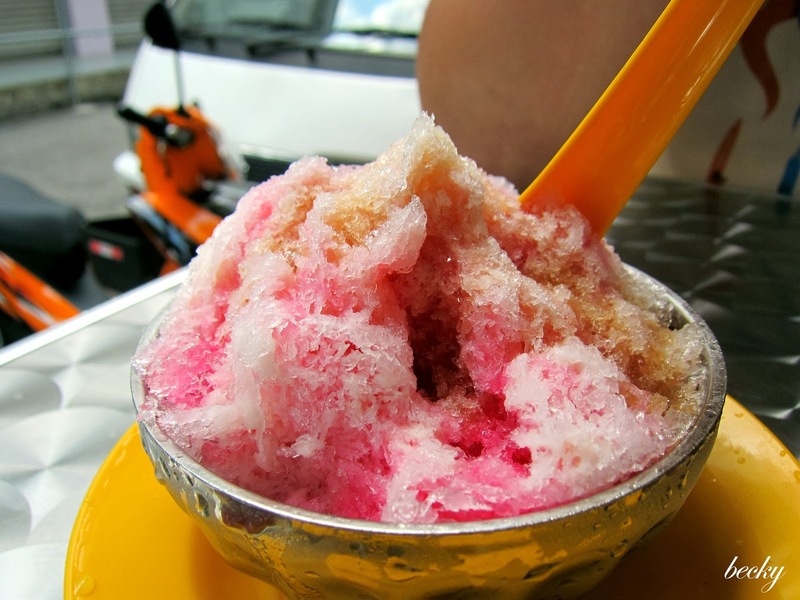 The coconut milk was flavourful and fragrant; the gula melaka (Palm Sugar) gave it a slight sweetness and the ice was shaved thinly - unlike at some places you'll still get chunks of ice here and there. 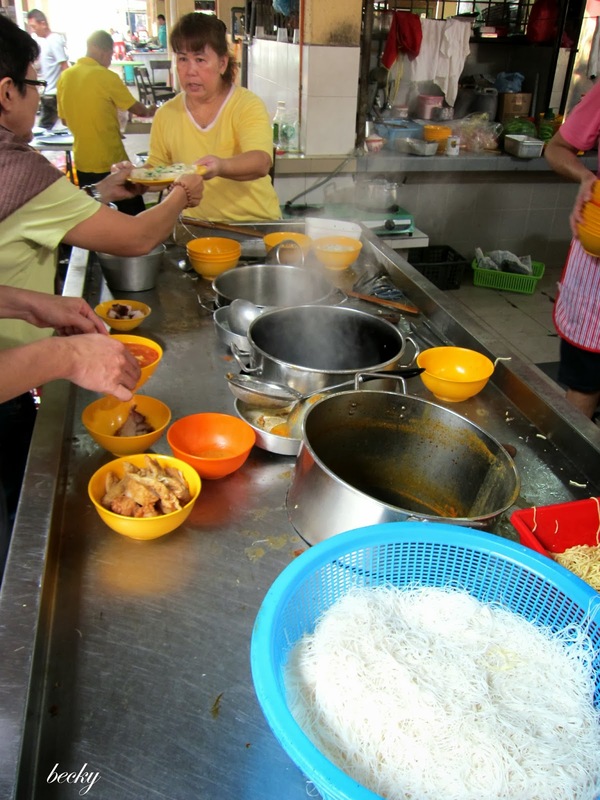 On our last day in Kuantan, I was still craving for Curry Laksa. Unfortunately, one of their famous shop was closed on Monday, so we had to find some alternatives. 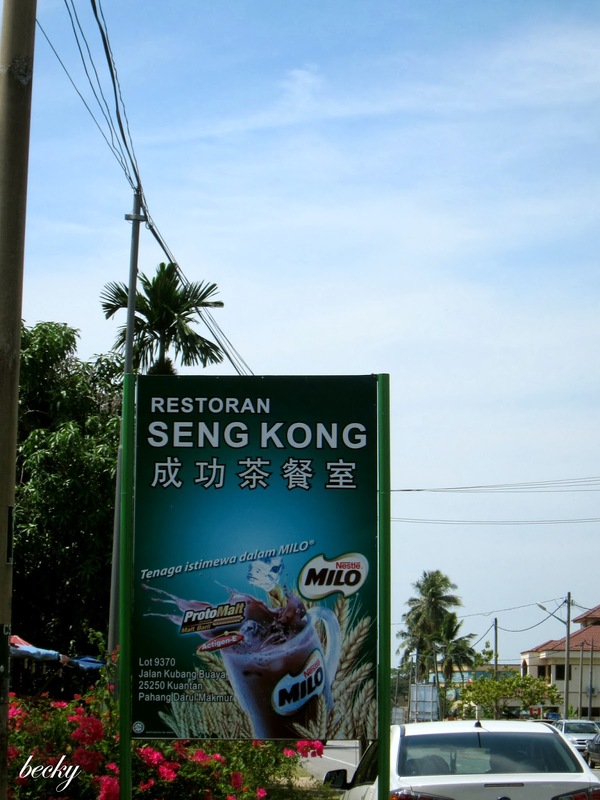 We ended up at Restaurant Seng Kong near to Joe's house. 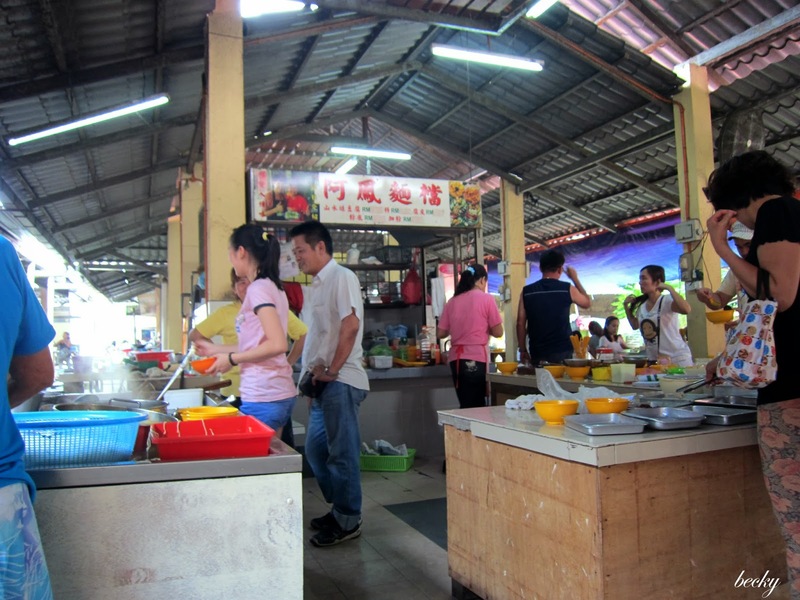 They had a few stalls selling different food, and finally I managed to have my Curry Laksa before we left Kuantan. 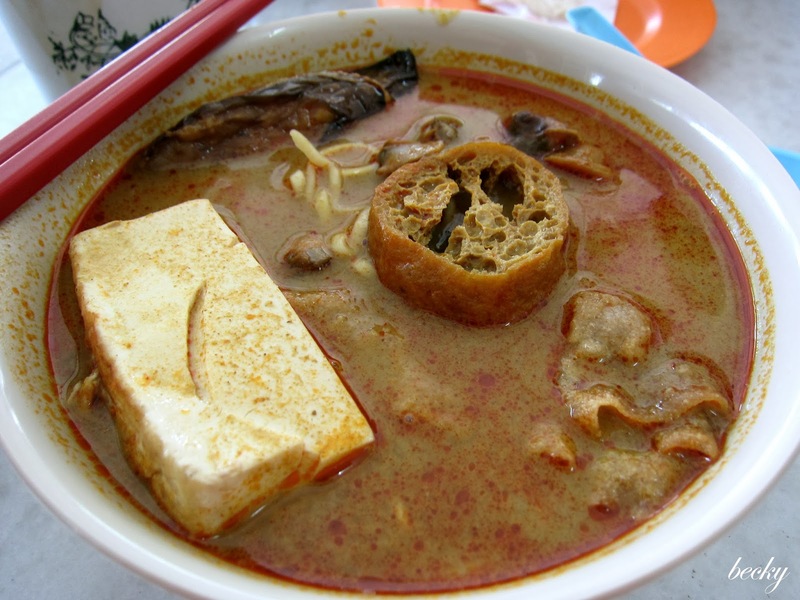 One thing I like about the curry laksa, is the noodles. 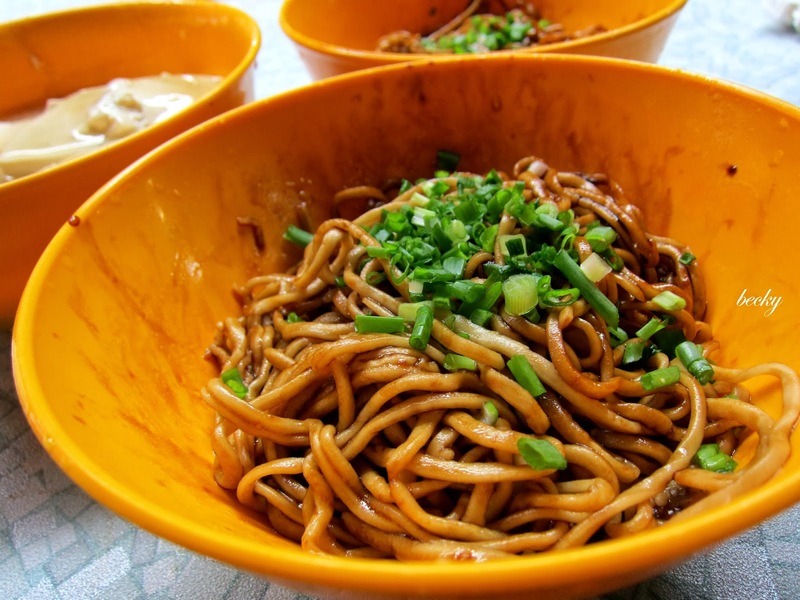 It used the same noodles as the ones in Sungai Lembing, instead of the usual yellow noodles. 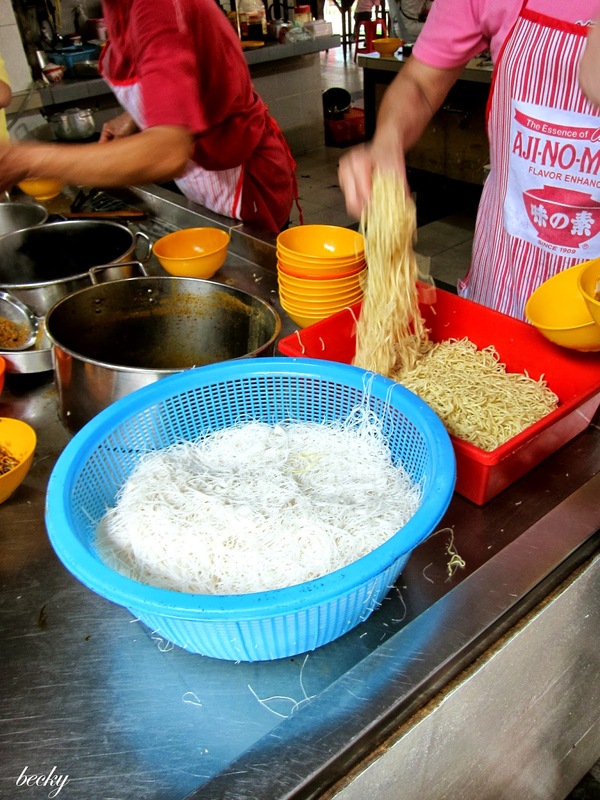 You can choose what other dishes you like to add into your noodles. The broth was not too bad, but I think some might think is a little to salty. I couldn't wait till the next time that I'm there. Beaches and delicacies!